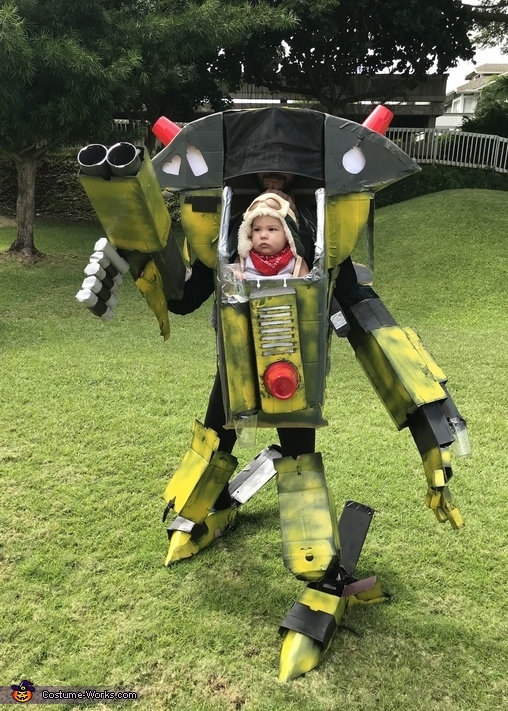 This is a costume I'd wanted to make since before my son was born 6 months ago! Long story short: my wife and I got a Baby Bjorn carrier for my Lyric in the months leading up to his birth which is where I got the idea to construct a halloween costume surrounding the carrier. (My wife and I take costuming VERY seriously.) So I got to work building the frame out of PVC piping and respective joints (about $40), my job allots me as many boxes as I could need which I took advantage of; providing the body and limbs of the mech. The paint job was about $18 of paint, had to be zero VOC for babies safety. The lights I had installed into the mech totaled around $40 altogether, I wanted it to really glow at night and draw attention. Along with the zip-ties and duct tape used to construct the mech I spent somewhere around $120 or so. Lastly I printed out a picture of Lyric with his mom to hang on the inner left side of the mech and a pretty little infant girlfriend for him on the right, so he'd not be without inspiration when he's out there fighting crime in his mech. The biggest challenge was keeping in mind how I'd put it on in a practical manner while still being mobile and have little Lyric be as comfy as possible.